Today’s dish seems custom tailored for this time of year; a kind of culinary segue from late summer into fall. The combination of colors, textures and flavors is vibrant, yet comforting, and makes a great addition to an end-of-season BBQ. One hint: Make the salad as early as possible before serving (even the day before), in order for the flavors to fully develop. Recipe courtesy of the Hay Day Country Market Cookbook by Kim Rizk. Bring water to boil in a vegetable steamer. 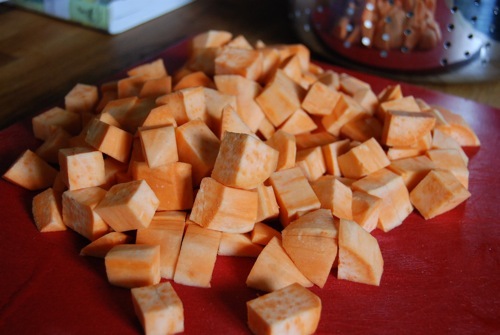 Put the sweet potato cubes into the steamer basket, cover and steam just until fork tender, about 10 minutes. Meanwhile, measure the mustard, vinegar, honey and oil into a small mixing bowl and whisk together until smooth. 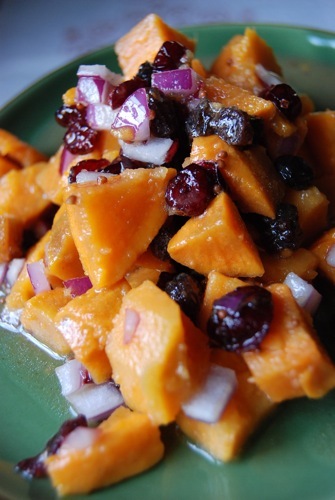 In a large bowl, combine the red onion and dried fruit. 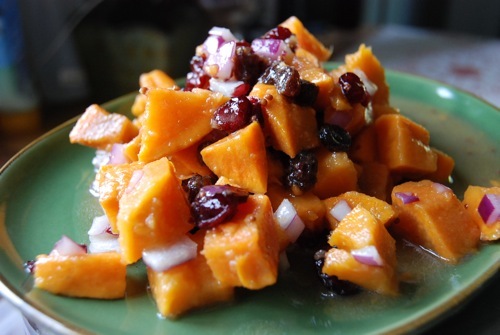 Add the steamed sweet potato cubes along with the dressing and gently toss to coat evenly. Cover and chill at least 1 hour before serving. Just before serving, toss in the pecans, if desired. What is the brand of the Dijon mustard you use? I’m having trouble tracking some down. Hi Nancy! I use Westbrae no-salt-added stoneground mustard. I buy it at Whole Foods; it’s also sold at other natural food stores as well as online at healthyheartmarket.com. Hope this helps!